May | 2010 | Stay out of trees! 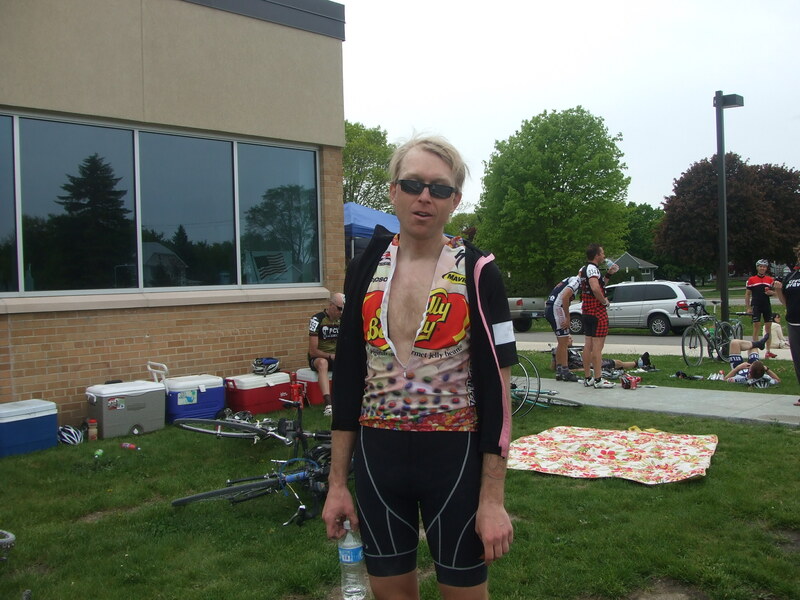 My history with the Almanzo 100 has basically consisted only of my desire to ride it, until yesterday. I was going to register in 2007 but I had already registered for Dirty Kanza and they were on the same day. Last year I was registered, but our bike shop had just opened 3 weeks before so my training had been kaputz and I thought it would demonstrate even poorer form to abandon Cody with our just opened shop to go ride my bike for fun. This year it all worked out and there I was at the start line at 9:00am. I lined up near the front, there was some witty banter and we (all 300+ of us) sang Happy Birthday to the 4 year old son of promoter Chris. It was a beautiful morning, warm and sunny, light breeze. No arm or knee warmers required! We got rolling right on time and with such a big group it was a bit crowded, but everyone was pretty well behaved. Until we hit a screaming long curvy gravel downhill about 4 miles in. The Eppen tandem let it all hang out, we all scrambled to keep contact and someone behind me lost control and went down with some other people. It sounded nasty, I risked a quick look back and saw bikes going every which way and a tumbling person through a big cloud of dust. Ouch. A lead group had thus formed. We climbed a really big hill, I lamented my decision to not use a drop bag and just carry my 4 bottles… The lead group was small now, and every downhill the Eppens were just letting it roll which made the descents just as taxing as the climbs. At some point after holding the wheel, losing the wheel, chasing back on and seeing a really big hill ahead I pulled the plug and fell off. Like 10 miles into the race! We were averaging over 20mph at this point. Little groups of ones and twos started to form behind the lead group of 20. I found myself in a group of 3 and we were working well together so I was not worried. Then we took a turn 15 miles in and saw that lead group just sit up. So all of us little groups of chasers got back on and one large group also regained contact. The terrain was rolling, with the occasional tandem fueled rocket descent which was always followed by a granny gear (38×27 for me) climb. I felt I was climbing well, at least. There were a couple of touch and go moments in here for me, the average was still around 20 at the 25 mile mark, there was a separation somehow and I had to use a lot of energy to go across a gap or two and keep in contact. In my head I was wondering if this was a good idea, and how long this pace could be maintained. One good thing, we had all made it clear that we wanted an Iowa City rider to win, and as the group continued to whittle down there were still a lot of us in it. 33.4 miles in we took a left turn, and there was a tractor there and the Eppen tandem punched it through on the inside of the corner while the rest of us scrambled around and what do you know, it was another of the long and winding descents so they were off to the races. It was hard to keep position in these moments without hammering for all you were worth. My bike had a 48×12 for the top end and I think I would have needed a 53 to have a real chance of hanging with that tandem! I gave it some gas anyway and was still in tacit strung out contact at mile 34 where the course took a hard left and went from screaming descent to leg breaking climb. Not because of the climb so much as because we had all just been working so hard to stay on. I knew the climb was coming and got to the little ring, but did not get the rear der out of the 12 so as I started up it was all bad. At least I had not wound up in the ditch. The climb was not very long, but a quick look ahead showed the carnage in progress. I had to go to damage control and just drag myself over the top, it looked as if the lead group was down to about 10 as they went over in front of me. There were more ones and twos in between, I figured I was just inside the top 20. A look back showed just more ones and twos and lots of emptiness. Still feeling that this was just too darned fast I decided to go forward rather than back and gave it as much as I could to reel in some help. I carried on solo for 4 1/2 miles and was just catching a couple when I got caught by a group of 6 or so coming up from behind. Way to waste energy, I thought to myself. But now, we had a group of 10, and I did not figure there were much more than 10 ahead. We kept the group moving, I ate some food and at mile 43 there was another steep and long climb which I pulled us up and I was still feeling okay, even if I continued to think that this pace was awfully ambitious. As I remember the next 20 miles or so to the checkpoint did not have much for leg breaking climbs, and we just kept a good steady tempo and gobbled up some miles. We lost a couple members of our group and caught a couple of people that were going backwards. Around mile 50 I was feeling very good and started taking some long and steady pulls in the 20+ mph range. Todd Gillihan from Iowa City was also in our group and the two of us did a good bit of work through here. The checkpoint took it’s time getting to us, but it finally appeared. They handed us our next set of cue sheets (3) and I bagged them. Todd had a drop bag and I threw my 2 empty bottles in as well as my top tube bag after I put the contents in my pockets. Stop was less than 2 minutes for me, but half of our group was already out of there. I was disappointed, I thought we had a good thing going, but these rides are all about staying in motion so that is just the way it was. As I left I could still see all of them ahead so I set about picking them off. I got one quickly, the second took a bit longer. The 10 miles out of the checkpoint were very hard. Big hills! I don’t know if it was because of the quick stop or just generally wearing down but my legs really wanted to cramp up. I drank more liquid, massaged them as well as I could and kept going. They never did cramp but I think it was close. So I was riding alone, just over 70 miles done, and the legs started to come around. There was another rider ahead who had been in our group earlier and it took a while but I was able to catch on with him. Right as I was coming up on him he got hassled by a dog, and since the dog was focused on him it did not notice me and I was able to sneak up onto his wheel. We happily worked together, got honked at and then buzzed by an angry gravel road motorist, and then bombed the dead end road to the water crossing. It looked deep enough to hose a drivetrain so I followed Cully’s advice that your feet are going to get wet anyway so walk over and save your chain. The water was cold! As we were getting back on on the other side another guy from our earlier group hit the water crossing while we started up. It was a good climb through an old quarry and it got my legs to thinking about cramping again, but I could tell they were just teasing me and were going to be okay. We climbed out and crossed a road at mile 81.6, still just the two of us as the other rider had not made contact yet. I was feeling pretty good about things here, less than 20 to go and the average still at 18mph, amazingly. We kept moving and sometime in the next two miles got caught by the indefatigable Gillihan and the rider who had almost made contact with us at the water crossing. With four people it felt like a vacation every time you pulled off the front! At mile 92.2 we turned onto Nature Rd, which looked familiar and we remembered it as one of the roads we had bombed down in the morning chasing the tandem. That memory, and the big bluff off to our right told us we were not done with the climbs… I figured there would just be one but somehow that crafty promoter managed to find 2 to hit us with before the finish. The last one was at mile 97 or so? One of our group gapped us on the climb. It was a slow motion move, we were going just 6 or 7 mph and he just distanced us a little more with every pedal stroke. I was bummed and ready to throw in the towel and just roll in with the group of 3 but Todd was not willing to surrender. The terrain really flattened out and he put in a big pull to close the gap. So I helped and it hurt. I think I took 2 good pulls, but what the heck. At mile 98.7 the guy away kind of hesitated at a corner and we were on him, all back together with 2 miles to go. I was tired, and I was happy to have kept up the 18 mph pace for the full 100, so I took a look back and when I did not see anyone coming to steal my spot at the line I threw in my little mental towel and sat up with just 1 mile to go. I rolled in to the finish, saw Todd take the sprint of our group, which turned out to be for 11th place! I finished 14th, and was really happy to get off my bike. 100.6 miles, 5 hours 38 minutes, 18mph average speed, 45mph max. Found out that the Iowa City contingent had indeed rode strongly, the Eppen tandem won in 5:15 (49.5 max! ), Jim Cochran 2nd, Rock Lobster 3rd, Nick Martin 5th, Geoff Perrill 6th, Todd Gillihan 11th and me in double lucky 14th. The top 3 women were all from Iowa City, too! It was a great race, killer course, superb organization. People kept rolling in to finish all afternoon and it was a good time just hanging out, swapping stories, and enjoying the day. Big thanks to the promoter, that guy must put an amazing amount of time and energy into this event. I can not say it enough, it was top notch. Big thanks also to my travel companions Scott and Jeremi, it was fun.